Amazon CloudFront is used for content delivery and has edge locations all over the world. Amazon CloudFront minimizes end user latency by delivering content from its entire global network of edge locations. Since the cost for each edge location varies, AWS charges also vary depending on the edge location from which CloudFront request is served. More classes and categories will be added in future by AWS. 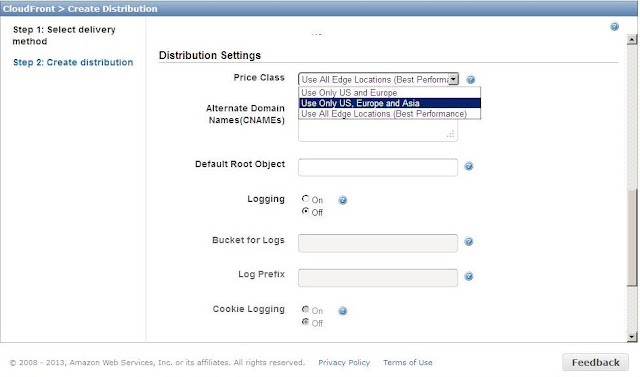 This configurable option lets you reduce your delivery prices by excluding Amazon CloudFront’s more expensive edge locations from your Amazon CloudFront distribution. Note: If you choose the price class that includes only the United States and Europe, viewers in Australia and in Asia may experience higher latency than if you choose the price class that includes Australia and Asia. Cost Saving Tip 2: How right search technology choice saves cost in AWS ? Cost Saving Tip 5: How Amazon Auto Scaling can save costs ?